Street art installations are interesting - it's odd to see them being installed yet they aren't as 'offensive' as aerosol work. Fit for seniors. 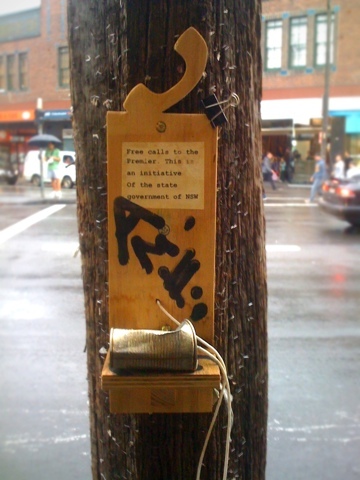 Now this installation, made of carved timber, cord and a can, was fixed onto a light pole in the centre of bustling Newtown. The artist has written on it: "Free calls to the premier. This is an initiative of the state government of NSW". A Greens voter perhaps? Look, if you talk into that can I bet you'll be heard. As much as you are now. It's just like a real world version of blogging tbh. How quaint! !